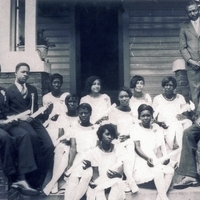 Crooms Academy Graduating Class of 1929 on the steps of the home of Professor Joseph National Crooms, located at 812 South Sanford Avenue in Sanford, Florida. The Crooms Academy of Information Technology is located at 2200 West Thirteenth Street and was founded by Joseph Nathaniel Crooms as the first African-American high school in Seminole County in 1926. Professor Crooms and his wife, Wealthy, donated the land on which the school was constructed. The professor served as the school's principal until his retirement in 1953. In 1970, Seminole County Public Schools desegregated and changed i's functions numerous times. In 1973, the original school building burned down; other school buildings have deteriorated over the past couple of decades. In 2000, the United States Department of Justice allowed Seminole County to lift it's desegregation order by 2003 under several conditions, one of which was to rebuild Crooms Academy as an academy of information technology. Crooms Academy currently functions as a magnet school with Information Technology Certifications in A+, MOUS, MCP, CCNA, MCSE, and others. Original 8 x 10 inch black and white photograph, 1929: Seminole County Public Schools Collection, UCF Public History Center, Sanford, Florida. "About Crooms Academy…" Crooms Academy of Information Technology, Seminole County Public Schools. http://croomsaoit.org/#about. Postal, Leslie. "Historic Crooms Academy Embraces A High-tech Future." The Orlando Sentinel, November 23, 2001. http://articles.orlandosentinel.com/2001-11-23/news/0111230278_1_crooms-academy-seminole-sanford. "The Crooms Academy High School Exhibit." Seminole County Public Schools. http://www.scps.k12.fl.us/studentmuseum/InsidetheMuseum/Crooms.aspx. Robison, Jim. "Professor's Legacy Lives On In Seminole School History." The Orlando Sentinel, August 4, 1991. http://articles.orlandosentinel.com/1991-08-04/news/9108030386_1_crooms-academy-sanford-hopper. "Education In Goldsboro & Sanford." Goldsboro Historical Museum. http://www.goldsboromuseum.com/The-Education-In-Goldsboro.html. 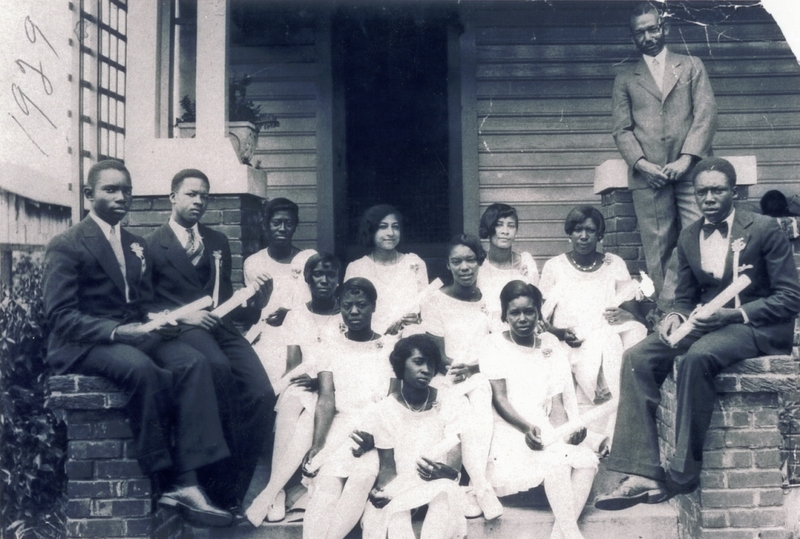 “Crooms Academy Graduating Class of 1929.” RICHES of Central Florida accessed April 18, 2019, https://richesmi.cah.ucf.edu/omeka/items/show/2787.